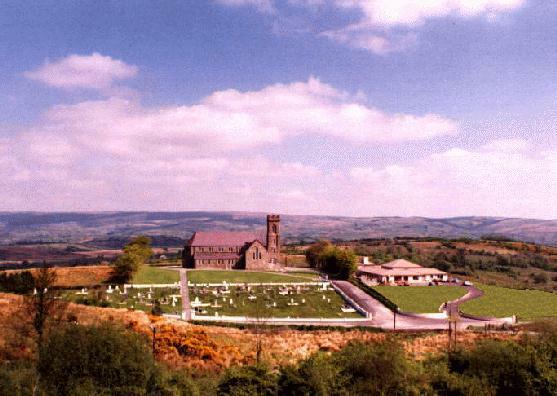 The McGreal / McGrail family that married into the McTiernan family is from the Townland of Lisfuiltaghan, Civil & Catholic Parish of Inishmagrath, Diocese of Kilmore, Barony of Drumahaire, Probate District of Ballina, PLU of Manorhamilton, County Leitrim, Connaught, Ireland. Lisfuiltaghan is W of Lough Allen and south west of the town of Drumkeerin. Townland of Lisfuiltaghan runs north and south at W 08.09'30" by N 54.08'30". The Gallic root word of Lis means fort. The McGreal / McGrail family motto is "Per Virtutem Scientamque" which means "By Virtue Knowledge". Three sisters settled in St. Louis, MO in the early 1890s with their brother, Stephen staying in Ireland. Anne McGreal , my grandmother returned to Ireland and then for the second time immigrated to St. Louis, MO in 1895 with her husband, Hugh McTernan VI. Greg McGrail's family that settled in Staten Island, NY, Hugh McGrail's family and Sean McGrail's family that settled in the Boston, MA area are branches of the McGrails from Lisfuiltaghan. The Chapel of Inishmagrath in Drumkeerin is where many of the McGreal's were baptized and married. The ancient Abbey of Tarmon is where many of the family are buried. The 50 page history of the McGreal / McGrail family from Lisfuiltaghan. The PAF descendancy chart listing all known descendants of Mrs. McGreal, <1797--8-20-1836.
cGreal family Blazon of Arms and Crest explained and translated. 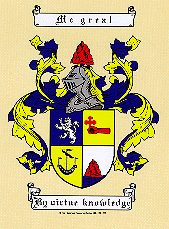 Another very inspiring McGrail Blazon of Arms and Crest supplied by Hugh McGrail of Boston. The Tartan of the McGrail Clan. Searching for links to other McGreal / McGrail families.